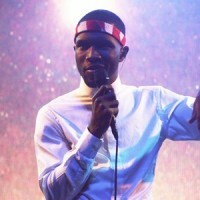 Frank Ocean Grammy Rehearsal Video and an Unreleased Song Called “Eyes Like Sky”? The artist claims that his ear piece was not functioning correctly and that led him to being slightly off-key. We, of course, have to take that with a grain of salt. However, all of his television performances thus far have been on-point, so there’s likely some truth to that. Regardless of how he performed on stage that night, Frank Ocean proves time and time again that theatrics and pyrotechnics aren’t required to move an audience. Pulling back from the light shows and big bands that preceded him, Ocean used a 4 screen video montage that gave the illusion that he was running on a long open road, much like the subject of the song performed. This morning, Frank made a smart decision to post a video on his Tumblr from his rehearsal for Grammy night. This rendition of “Forrest Gump” is far better in terms of performance. Different from the album’s pop-driven version, it hits a more intimate tone. If that wasn’t enough for you, there has also been a leak of an apparent Channel ORANGE B-side entitled “Eyes Like Sky.” There is also a strong possibility that it could be a songwriting demo. Either way it doesn’t quite fit the vibe of last year’s hit record. You can watch the rehearsal performance and listen to the leaked track after the break.